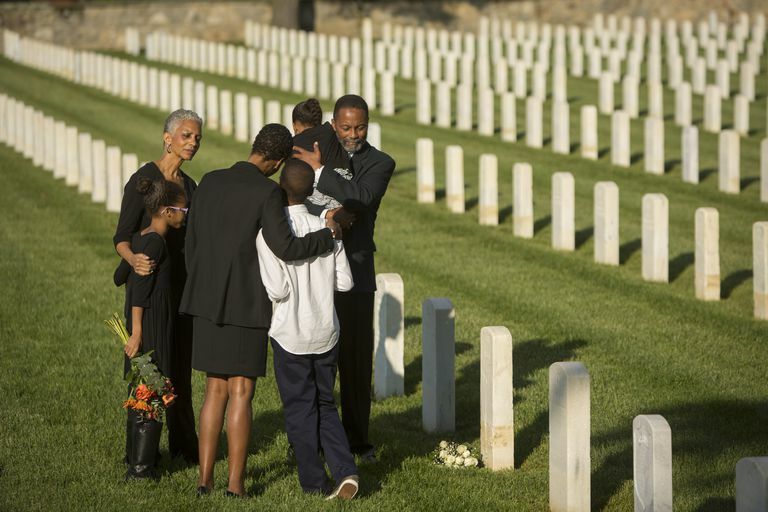 The annual Father's Day holiday can prove challenging for anyone mourning the loss of his or her dad, even many years after he died. Here are 10 meaningful ways that you can honor your deceased father and keep his memory alive on Father's Day or any of the other 364 days in the year. What did you and your father enjoy doing together? Whether you cooked on the grill, played baseball, went to the opera, or watched a favorite TV show, you can honor your father by doing that act together with others who loved him. Before starting the activity, take a moment to share your memories, photos, videos, or stories of Dad. Writing or journaling your thoughts and feelings is an effective way to reduce stress and often proves therapeutic. Whether you express yourself best sitting at your computer or using paper and pen, consider writing a private letter or even a poem describing how much your father means to you. Honor your deceased father this Father's Day by visiting his gravesite or the spot where his cremated remains ("ashes") were placed. While there, you should remove any debris, such as leaves or dead flowers, from his resting place and then leave a fresh floral bouquet to mark your visit and your love. Now may also be a good time to "talk to" your father, letting him know how much he meant to you. If you have space in your yard, consider planting a tree in memory of your dad. After buying the sapling from a nursery, dig the hole and then have your family gather to say a few words or share their favorite memories of your father. After placing the tree in the hole, ask each family member to toss a handful of dirt in before you finish planting and watering the tree. You could also place a small engraved "In Memory of..." plaque at the base of this living reminder of your dad. If you don't have the space to plant a tree in your own backyard, consider donating one to a local hospice, library or place of worship to beautify your community in your father's memory. Scrapbooking is creative, fun, and a wonderful way to create a lasting visual memorial to someone you love. Start by collecting and printing images of your Dad that evoke fond memories. If you like, ask others to do the same. Then, alone or with friends and families, get to work. Father's Day or a long holiday weekend offers a great opportunity to look through images of your family, share the stories behind the photos, and create a special scrapbook as a tribute to your father. Make a donation to a cause meaningful to your dad in his memory, or to help find a cure for a disease, such as cancer or Alzheimer's. You might also consider volunteering a few hours of your time to benefit others. For a list of opportunities to help someone else in your area, please visit the Volunteer Match website. Shoot a simple tribute video with your smartphone, or create a fully edited slideshow from your favorite photographs and set it to music. Once finished, share it with your family and friends, or post it online like this YouTube tribute video to let the world know how much you love your father. If you traditionally took your dad out for a meal on Father's Day, his birthday or some other special day, gave him a gift or just hung out with him for an afternoon, consider brightening life for another father by doing the same thing for him. If you don't know of somebody already, ask around at your place of worship, a nursing home or hospice, or even at your workplace. While your father can never be replaced, consider your actions a gesture of love in his memory that would make him proud of the child he raised.